Deal of the day: Mercedes-Benz E63 AMG S Estate | What Car? The Mercedes-Benz E63 AMG S is monumentally fast. Its 5.5-litre twin-turbo V8 produces 577bhp and nearly 600lb ft of pulling power. Channeled through a seven-speed automatic transmission, it gets the E63 AMG S from 0 to 62mph in just 4.1sec. The adjustable suspension is best left in comfort mode, because it's too jarring in sport or sport plus modes. Road noise is intrusive on the motorway due to the large tyres, but wind noise is well contained. General refinement is surprisingly good considering the performance on offer. 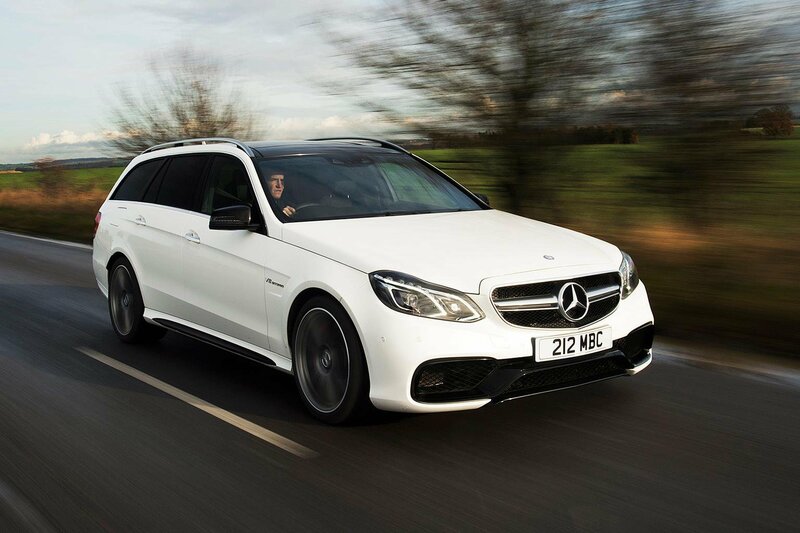 The E63 handles well, while the steering is precise and well weighted, which boosts confidence on a twisty B-road. The S also gets a mechanical limited slip differential as standard, which means traction is even better than in the standard model. The cabin is large and even six-footers will be comfortable in the rear seats, while the boot is huge. There's also lots of standard kit. It’s still significantly more expensive than the non-S E63 AMG, despite not adding that much extra power. In fact, the non-S could well be the better bet unless you need the bragging rights of the ultimate E-Class. The gearbox isn’t as sophisticated as the twin-clutch unit in the BMW M5 or the torque-converter auto in the Audi RS6. It tends to hesitate when setting off from a standstill. Fuel economy is just 28.5mpg and CO2 emissions are 232g/km. An E350 CDI will still feel fairly quick but return much better figures at the pumps, although it won’t excite your inner 12-year-old in quite the same way. Mercedes-Benz offers a vast array of options for the E63 AMG S, so be very careful the price doesn’t get out of hand. We’d recommend avoiding most of it, but if you plan on taking your car to a track day then carbon-ceramic brakes are available. Also available are numerous driver aids and camera packages to make driving and manoeuvering that little bit easier. Head to orangewheels.co.uk and search for Mercedes-Benz E-Class to see the range of deals available.